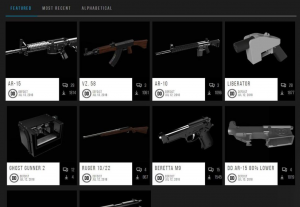 Starting tomorrow, Aug. 1, the company Defense Distributed will make plans available to download plans for 3D printable guns. The company was prevented from making their plans available due to a restraint order previously put in place by the State Department. Cody Wilson, the company’s founder, sued over the restraining order, eventually being joined by the Second Amendment Foundation, a large pro-gun rights group. Originally, the government sought to block distribution of the downloadable plans under policies that govern with the International Traffic in Arms Regulations (ITAR), however, the State Department will soon relinquish their control of these policies to the Commerce Department. This created a loophole in which both Defense Distributed and the Second Amendment Foundation could sue the government to lift the restraining order under the pretense that the State Department will not be regulating ITAR in the future. Under the settlement terms, they will waive prior restraint against Defense Distributed – opening the door for them to publish 3D plans for firearms online – along with agreeing to reimburse them $10,000 in registration fees and covering most of their legal costs. The Second Amendment Foundation framed the issue in a press release on July 10 as one that was needed to protect First Amendment rights, claiming that the government was attempting to “control free speech” through their restraint order and that the ITAR regulation was a vestige of Cold-War era policies to regulate the export of arms abroad. According to watchdogs, ITAR regulations “ensure that defense-related technology does not get into the wrong hands,” which would include criminal syndicates, terrorists, and those seeking to cause harm. 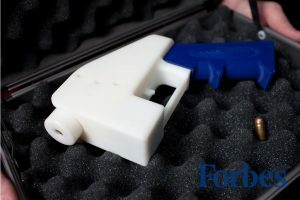 The 3D printing of firearms effectively makes standard security mitigations obsolete given the weapons will be printed with materials that can defeat most kinds of search detectors. In 2013, Wilson, the founder of Defense Distributed, released plans for a handgun called “The Liberator” of which all 16 component parts were made entirely of ABS plastics and could be printed with a standard Dimension SST 3D printer. The NY Daily Post has reported that over 1,000 people have already downloaded plans for 3D printable guns including AR style rifles – prevalent in most recent mass shootings throughout the US. As a result of the policy shift, Attorneys General from eight states and Washington, DC have filed a lawsuit against President Trump’s administration to stop the online publishing of the plans. Virginia is currently not one of the eight states. President Trump, for his part, weighed in on Twitter this morning saying, “I am looking into 3-D Plastic Guns being sold to the public. Already spoke to the NRA, doesn’t seem to make much sense!” According to reporting by Forbes, the NRA has been conspicuously silent on the issue and in some instances has openly mocked gun-control advocates for raising concern about how non-detectable weapons might impact public safety; you know, like preventing terrorist attacks and mass shootings. A school is supposed to be a safe place for learning and growing, but they’ve become places where children’s lives are threatened by routine gun violence. Solutions to this problem have been offered from every corner of the country, but progress still seems stalled by politics and money. Many gun control advocates point to the 1996 Dickie amendment, banning the Center for Disease Control from studying gun violence as a primary factor. Twenty-two years later high school students are giving up their seats and walking out during school. Student activists, along with Women’s March Youth EMPOWER, are promoting a national school walkout scheduled to occur at 10 a.m. on March 14 for exactly 17 minutes in honor of the 17 victims in Parkland, Florida. School shootings are now the norm. Counting every discharge of a firearm on school grounds, the group Everytown for Gun Safety reports over 290 school shootings since the Sandy Hook elementary shooting. Congress still refuses to address or change gun control, but after 17 students and staff were gunned down at Marjory Stoneman Douglas High School in Florida on Valentine’s Day, students nationwide have taken control of the conversation to demand change. Students and administrators are now facing tough decisions on how to approach the walk-out. If school leaders support the walk-outs they may be held liable if something happens to a student; if they don’t, they may face political and personal consequences from the growing movement. The fear this teacher feels for the lives of her students has negatively impacted her ability to provide the best education she can. At one point, the Henrico Superintendent momentarily stopped the speakers to address their fears that they’d face suspension for participating in the walkout. Gun control was on the minds of Commonwealth voters throughout 2017. 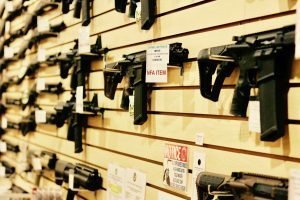 According to Gena Reeder, an organizer with the Liberal Women of Chesterfield County Gun Violence Prevention Group, it topped the list of concerns that voters had during the gubernatorial election. “Exit polls showed that Gun Violence Prevention was a top three motivator for voters at the ballot box, and the new landscape of our House of Delegates is the result of that,” Reeder said. Reeder is a member of Moms Demand Action, an advocacy group that formed after the shooting at Sandy Hook Elementary School and left 20 children and six innocent adults dead. She has lobbied across Virginia for common sense gun legislation in the General Assembly. The National PTA released a statement in support of the walkout along with proposed safety measures and policy recommendations to prevent future school shootings. The policy recommendations are in line with those offered by gun control advocates, including an assault-rifle ban, universal background checks, and lifting any ban on research studying gun violence by repealing the Dickie Amendment. While productive conversations have taken place between students and administrators, it is still unclear what will happen to students if they participate in the walkout. The Virginia ACLU has pointed out that all schools across the county have to be treated equally, so it should not be up to each individual principal. Instead, the school board and superintendent should make a county-wide decision. As the 2005 National Teacher of the Year, as current @RPS_Schools Superintendent, and as a parent of two elementary-aged sons, let me be clear: arming teachers is an awful idea. The only answer: gun control. We reached out to his office on Tuesday and a spokesperson said they are working on a plan and were not ready to comment. Teachers have not offered wide support for the President’s suggestion. One high school teacher from Henrico who remained anonymous for professionals reasons told RVA Mag that she supports the walkout. Henrico County Public Schools spokesman Andy Jenks told RVA Mag that they are still working to provide guidance for schools. He said they want to be supportive of students and their families while also being mindful of safety concerns around students. While Republicans and Democrats continue to squabble over talking points and accusations of pandering to donors or special interest groups, children attending public schools across the country are pleading for their lives and forcing politicians to reckon with truths that are deeply disturbing and uncomfortable. Despite partisan accusations of being “paid crisis actors” and suffering a horrific, traumatizing event, Emma Gonzalez, Jaclyn Corin, David Hogg, and many others continue to advocate for gun control. The reality of school shootings has given them, along with every other kid in America, a personal background on an issue that remains ideological or partisan for many people in positions of power.